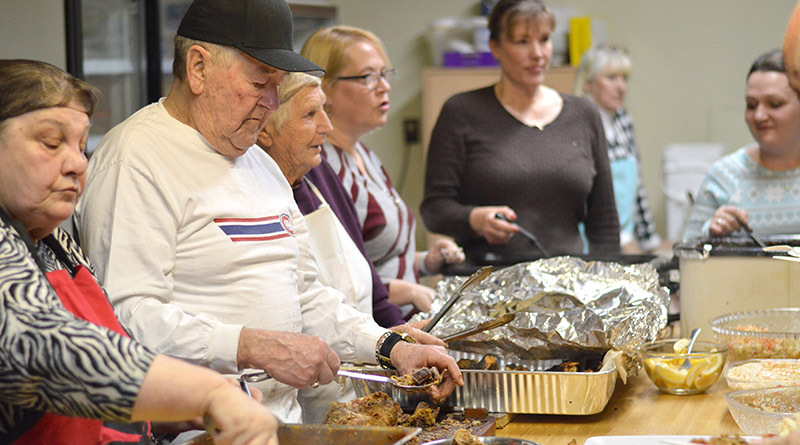 The Bryson Lions’ Club’s annual Wildlife Supper packed their hall Saturday night, where everything from their famous sea pie to bear and venison satisfied appetites that evening. Pictured, Fergus Wrinn and volunteers serve up heaps of bear, fish and more to the crowd. Local bears, deer and fish always have one night of the year that they’re celebrated most in Bryson – and that’s the night that local Lions pile guests’ plates high with the animals done up in all sorts of delectable methods. The Bryson Lions’ Club had their hotly anticipated and much-loved Wildlife Supper on Saturday night, serving up everything from their famous sea pie and bear balls to venison, trout, bass and more.